Home / Deals & Steals / Hazardous Materials Technician Curriculum USB, 1st Ed. Hazardous Materials Technician Curriculum USB, 1st Ed. 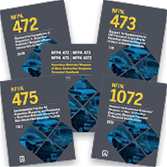 The Hazardous Materials Technician Curriculum builds upon the excellence of IFSTA instructional materials. Instructors know they can count on IFSTA to provide accurate, customizable, and complete curriculum. In addition, they have come to expect that IFSTA curriculum is up-to-date and will meet their training needs and those of their organizations. Each lesson contains a detailed, simple-to-use instructor presentation outline in Microsoft Word format. This format allows instructors to customize the files to conform to their own teaching preferences or local procedures if they so choose. Skill evaluation checklists and learning activities pertinent to the lessons are also provided. Customizable high-quality PowerPoint presentations also accompany each lesson. The following components are available on a Flash Drive and ResourceOne. The interactive PowerPoint slides will not work on a Mac computer. This is a known issue with the Mac version of PowerPoint. IFSTA Curriculum content for instructors is FREE to access on ResourceOne Website (r1.ifsta.org). 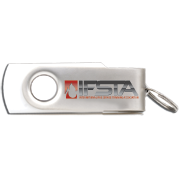 IFSTA Curriculum includes Lesson Outlines, PowerPoint Slides, Chapter Tests, Quizzes, Clip Art, and Skill Sheets (if applicable). 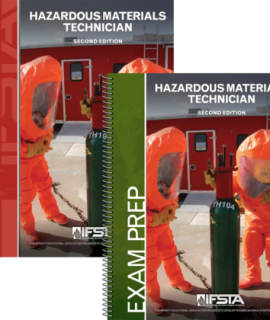 Hazardous Materials Technician Manual & Exam Prep, 2nd Ed. 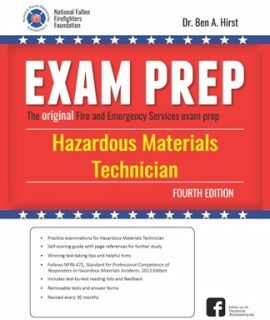 Hazardous Materials Technician Exam Prep, 4th Ed.